The Seabrook Sailing Club’s spectacular new clubhouse was completed in 2010 and is located in an enviable position right on the Galveston Bay waterfront. It is a large air conditioned facility with a complete kitchen. A covered deck extends around all sides of the clubhouse offering wonderful views of Galveston Bay, Clear Lake channel, and local sailing activities. An outdoor grill and dining area are located under the clubhouse. A children’s play structure is located on the front lawn where parents can watch their kids and activities on the water. 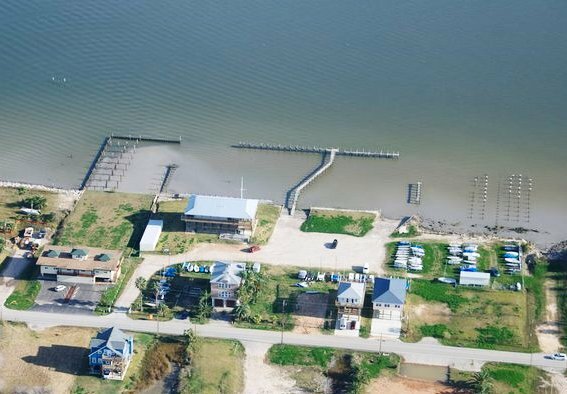 Boats are conveniently stored on the property with areas for rigging on the clubhouse front lawn and launching off our wooden ramp or two boat ramps. There is secure storage for windsurfing equipment and small boats in the mausoleum next to the clubhouse. Members have their own key to the property and are free to use the facilities whenever they like. A movie showing our club can be seen by pressing here.